Amazon Kindle DX $120 Off Today! 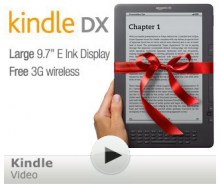 If a Kindle is on your list, here is a great price on the KindleDX this weekend. Amazon.com is offering the KindleDX for $120 off the price. The DX is normally priced at $379 and this weekend it’s only $259! If you’d like something a little more reasonable, you can still get the Basic Kindle with special offers for $79 on Amazon.com this weekend too. Offers Nov 24, 2011 in Amazon, Kindle · Expired!